Zink is the micro element which participates actively in the process of protein formation. It is involved into the functioning of the immune system, as well as storing and releasing of insulin. If you learn about natural ways to increase zinc and stick to recommendations, you will be able to boost the growth and regeneration of tissues, as well as to improve the metabolic processes within your body, because zinc is a composite of the majority of enzymes. Before you try natural ways to get zinc, it is better to consider whether this mineral is in deficiency in your body. Different amounts are advised for different age groups and genders. The National Institutes of Health recommends 11 mg of zinc to adult men and 8 mg to women. Pregnant and breastfeeding women are suggested to stick to slightly higher intake. Zinc deficiency symptoms include frequent infections, hair loss, bad appetite, problems with seeing in the dark or tasting or smelling, long wound repair processes, impotence in men and delayed sexual development in teenagers. The elderly people, people who take diuretics, children in developing countries, people with sepsis or burns, those with diabetes make the risk group. 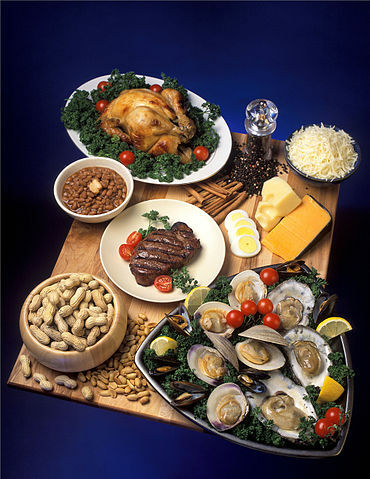 Zinc is present in a variety of foods. It is rather easy to find the natural ways to consume zinc and ensure the adequate amounts are taken. Check if any of the listed below products are in your home menu to make sure you receive zinc daily. Oysters (make the top of the list), lobsters, crab and other seafood. Red meat, like beef, lamb and pork, as well as liver have bigger amounts of zinc than fish. The dark meat of a turkey or chicken contains more zinc than the light. A lot of the nuts contain zinc. The top of the list is made by cashews, almonds and peanuts. Fruits and vegetables, according to Medical Centre of University of Maryland, do not make a good source of zinc, because in plant proteins, unlike animal proteins, zinc is not available for the use by the body, thus the vegetarian and low-protein diets appear to be low in zinc. Zinc gets lost in some foods during the cooking. Therefore the following tips should be remembered in order to reinforce the natural ways to increase zinc: use the minimal amount of water while cooking the foods, and make sure your food is cooked during the shortest possible time. Zinc competes with calcium and ferrum. When these elements appear together, the absorption of zinc gets reduced. Metabolism. Zinc is involved into synthesis and decomposition of carbons, lipids and proteins. It removes alcohol intoxication effectively. Immunity. Zinc is the most important nutritious substance for the immune system, as it supports the activity of antibodies, leukocytes, and hormones, which increase the resistance of the body to infections. Hormones. Zinc is necessary for the secretion, synthesis and utilization of insulin. It protects the insulin producing beta-cells of pancreas from destruction. It participates in the processes within hypothesis, thyroid gland, adrenal gland, prostate gland, ovaries and testicles. Skin. Zinc helps for the wounds healing, regeneration of tissues; it removes skin inflammation. Growth. Zinc is vital for the DNA synthesis and cell division, growth and regeneration of bones, nails and hair. Pregnancy. Zinc is linked to the healthy formation of the palate, brain, eyes, and bones of the babies. It influences the maintenance of the pregnancy. Perceptions. Zinc supports the full value activity of the perceptive organs, it sharpens vision, taste and smell. It is the prevailing microelement in the structure of the eyes. At the end, it is worth mentioning, that according to the National Institutes of Health, zinc-containing supplements may interact with some medicines, so those people, who look for the natural ways to consume zinc in your body, do the totally right and absolutely safe thing.